Spring is slowly showing its head here at the QuiBids offices in Oklahoma City, but the deals on our site are still as strong as ever! Below we’ve compiled a list of eleven big wins that caught our attention this past month. 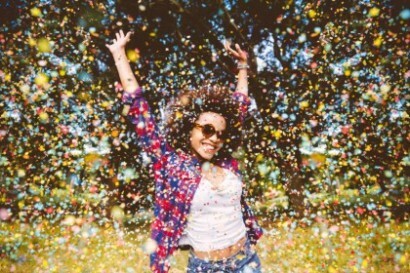 Feel free to add any of these wins to your Pinterest boards by hovering your pointer over each image and clicking the “Pin It” button that appears. Continue reading to see some epic wins from March 2015. 1. Samsung 40″ 4k Smart LED TV sold for $6.04! Won with Bid-O-Matic using 0 Real Bids and 91 Voucher Bids. 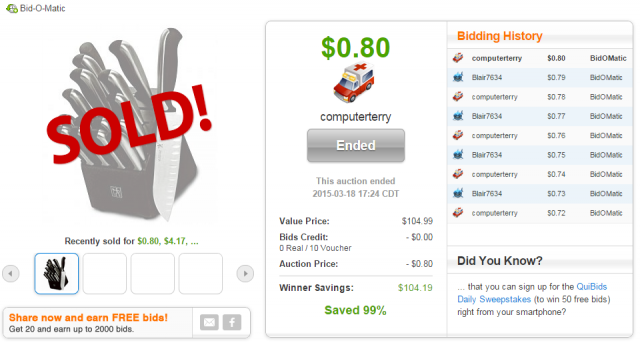 The winner saved $893.95 (99%)! 2. 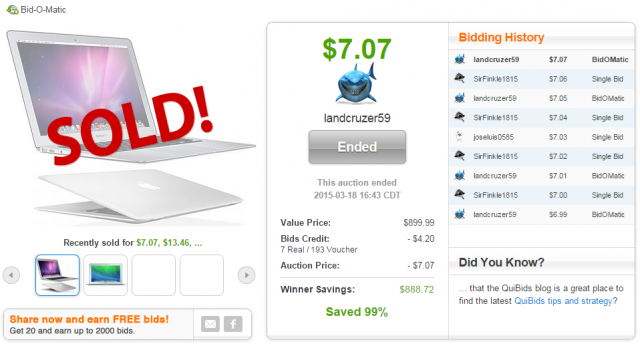 Apple MacBook Air sold for $7.07! Won with Bid-0-Matic using 7 Real Bids and 193 Voucher Bids. The winner saved $888.72 (99%)! 3. 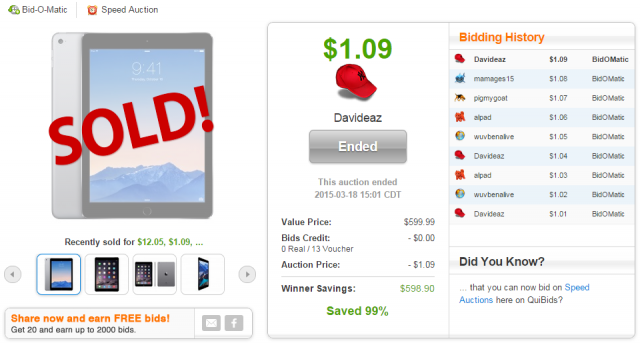 Apple iPad Air 2 sold for $1.09! 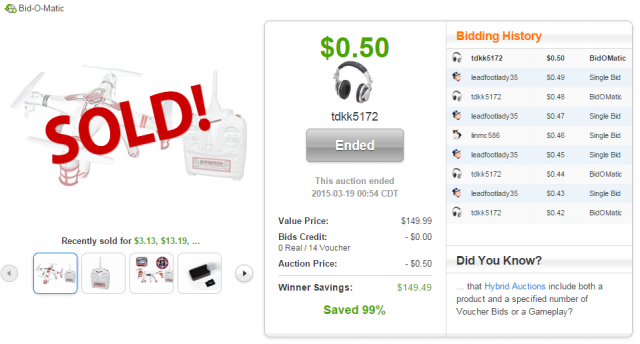 Won with Bid-O-Matic using 0 Real Bids and 13 Voucher Bids. Winner saved $598.90 (99%)! 4. 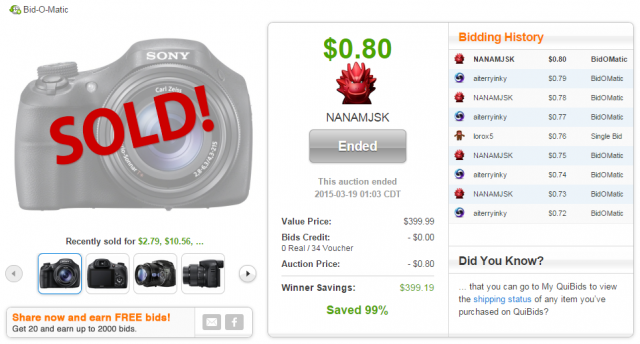 Sony Cyber Shot Digital Camera sold for $0.80! Won with Bid-O-Matic using 0 Real Bids and 34 Voucher Bids. Winner saved $399.19 (99%)! 5. 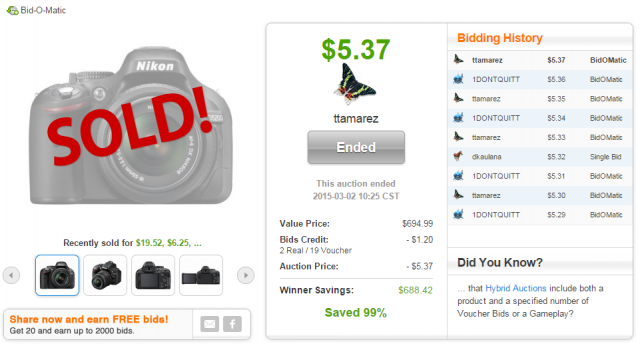 Nikon DSLR w/ 18-55mm Lens sold for $5.37! 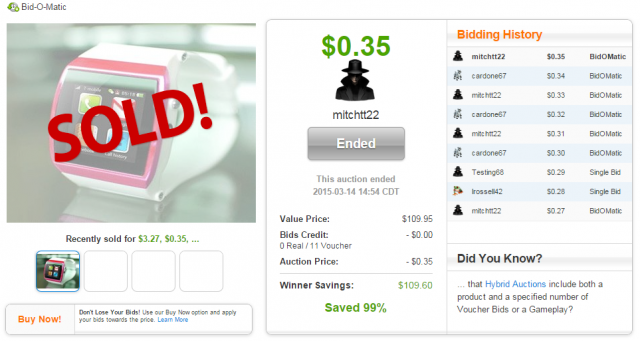 Won with Bid-O-Matic using 2 Real Bids and 19 Voucher Bids. Winner saved $688.42 (99%)! 6. Dyson DC47 Vacuum sold for $2.54! Won with Bid-O-Matic using 0 Real Bids and 29 Voucher Bids. Winner saved $437.45 (99%)! 7. 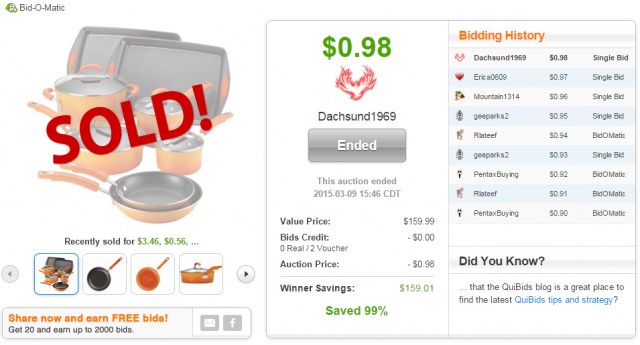 Rachael Ray Cookware Set sold for $0.98! Won with 0 Real Bids and 2 Voucher Bids. Winner saved $159.01 (99%)! 8. 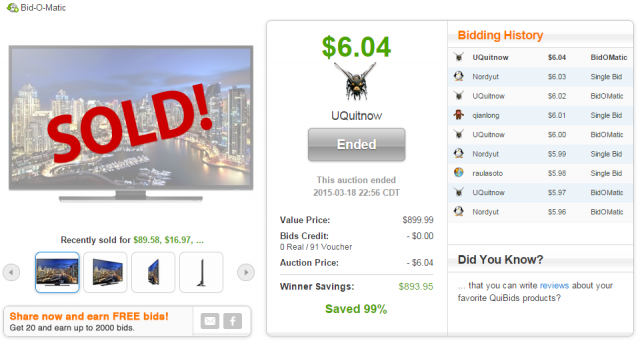 Supernova Drone Quadcopter sold for $0.50! Won with Bid-O-Matic using 0 Real Bids and 14 Voucher Bids. Winner saved $149.49 (99%)! 9. Kocaso Smart Watch sold for $0.35! 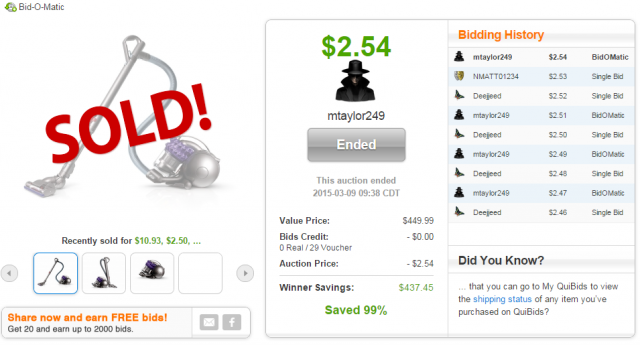 Won with Bid-O-Matic using O Real Bids and 11 Voucher Bids. Winner saved $109.60 (99%)! 10. J.A. Henckels Knife Set sold for $0.80! Won with Bid-O-Matic using 0 Real Bids and 10 Voucher Bids. Winner saved $104.19 (99%)! 11. 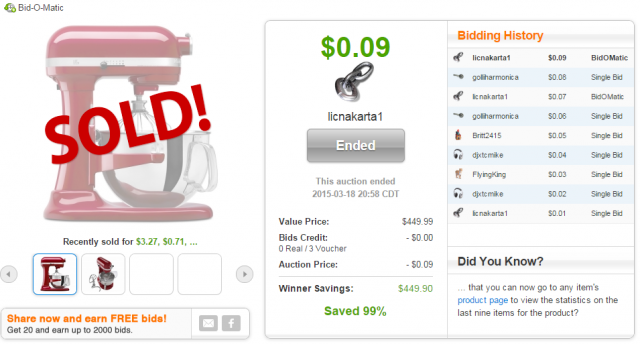 KitchenAid Professional Mixer sold for $0.09! Won with Bid-O-Matic using 0 Real Bids and 3 Voucher Bids. Winner saved $449.90 (99%)! What was your best win (or Buy Now) from March? Share in the comments!